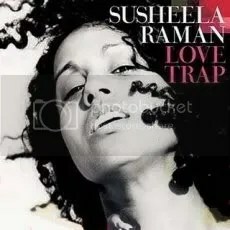 Susheela Raman, born in London, is an acclaimed British Tamil musician. Susheela’s parents are from Thanjavur in Tamil Nadu, India, who arrived in London in 1960s. At the age of four, Susheela and her family left the UK for Australia. Susheela grew up singing South Indian classical music and began giving recitals at an early age. As a teenager in Sydney she started her own band, describing its sound as Funk and Rock and Roll, before branching out into Blues and Jazz based music, which demanded quite different voice techniques. She tried to bring these streams together when in 1995 she travelled to India to rediscover her roots by way of exploring Carnatic music. Love Trap, produced by Sam Mills, is a pleasing and sensually charged album that takes on various folk music traditions to create a unique hybrid. The tracks are sung in various languages, infusing a myriad of styles, including Tuvan throat singing (overtone chanting) and the complex wail of India’s traditional Carnatic vocals. The album flirts with trip-hop, rock, and electronica. The music pulsates with energy and each musician is given a chance to shine on the album’s instrumental interludes. ‘Ye Meera Divanapan Hai’ was originally sung by Mukesh in the Hindi film Yehudi (1958). ‘Sakhi Maro’ is a devotional song by the 16th century mystic singer Meera Bai. Please forgive the spellings in the track names, as these have been taken in verbatim, as printed on the CD.